“I’m left-handed, right-brained and a Pisces. I want to be passionate about what I do. I’ve tried to live by that,” explains photographer, Scott Brashier. Those passions have created an interesting path, leading him away from Laguna and back again, even away from photography and back again, but he is and has been back for quite awhile now - more excited and more ambitious about those two things in particular than ever before. The interest in photography goes way back. “My dad was into photography. He wasn’t a very good photographer, but he bought good equipment that he would pass down to my brother and me. We were always the guys taking the pictures.” Then, by chance, the hobby turned into a profession. “Around 1988 I had a friend who worked at Surfer Magazine. Snow boarding had just taken off. My friend invited me to go with him and Bert Lamar who was world champion at the time. He asked, would I take some pictures? I took three. The first one I shot became the back cover for Sims snowboards. And so I found myself a professional photographer overnight.” The Sims shot led to a Coors beer poster, a Swatch poster and an Op poster. Eventually, he was photographing AVP tour events, pro snowboarding, pro surfing and pro skiing events. And this was a second job. His main job was working for a surf wear accessory company. Then in 1991 it all went away. “The recession hit. It killed the accessory business. Advertising money dried up. No more photos,” remembers Scott. Things were looking bleak until a friend and former mentor offered him a position at an ad agency he was starting – in six months. So Scott decided he would indulge in another of his passions, skiing, while he waited. He says he didn’t take one picture the entire time he was there. The photographer’s eyes had been reawakened. “One of the reasons I stopped taking pictures was that it was so expensive. I figured it was about a dollar a shot when you factored in the slides, the prints, etc. I didn’t have the drive to shoot a bunch of stuff I wasn’t going to do anything with,” he explains. Then came the Canon SD600. “The game changed when I got my first digital camera. It was the size of a deck of cards and you could just shoot and shoot and shoot.” The very portable camera was perfect to take on his runs. If he saw something that moved him, he would take a picture. Soon he started emailing his shots to family and friends who started forwarding them to their family and friends and the Brashier POD (Photo of the Day) was born. Scott explains, “The mantra of the POD is to celebrate the beauty that surrounds us that we lose sight of getting caught up in everyday life.” His audience expanded when a friend, Tom Burns, asked if Scott would add Stu Saffer to his email list. Shortly after that, StuNews and Scott began working together and Brashier, once again, found himself a professional photographer. Still, photography was a side business. When the last great recession hit, Scott left the car business to explore another one of his passions: tennis. No one is more enthusiastic about the game of tennis than Brashier. Deciding he needed to bring tennis to underprivileged kids in Costa Mesa, he got to work. “I really wanted to give back to my community and enhance the lives of young people through tennis.” However, even his abundant enthusiasm could not overcome a lack of facilities. “You don’t need a tennis court to teach tennis at first, but you do need one eventually,” he explains with a laugh. Without tennis courts for his program he realized “pretty quickly” he needed to come up with another plan. “I’d teach tennis for free if I could afford it,” he says. Since that was not an option, “I went back to the car business, selling Shelby Cobras and classic replica race cars. Selling really expensive cars is fun. They’re cars every guy wants, nobody needs and fewer can afford. That’s a fact,” he says smiling. Another fact is that Scott has taken his commitment to photography to the next level. “I’ve committed, after years of artistic insecurity, to commercialize my photography. I’ve done family sittings, product photography…I’m even selling my first art piece.” But he hasn’t lost his enthusiasm for Laguna and the bounty of images he sees as he goes about his day. With a commitment to seeing – and sharing – the beauty he sees everywhere, he has to be. We knew Chris Keller was a mover and shaker back when we wrote about him in a Stu News 2012 movers and shakers story. Guess what? He’s shown no signs of slowing down. Unless you add to his busy business life a new wife and new family. Then he slows down a bit to savor a home life with Amy, their daughter Alexis, and their nine-month old baby, Rocco. We caught up with Keller while he also had caring for his parents on his mind. He was back in the old hometown, New Jersey, and like many of us he was surprised how time has a way of sneaking up unexpectedly. The next thing you know, you’re helping out your parents instead of the other way around. Keller is a family man, though it may have taken having his own family to realize that. In the meanwhile, this 40-something young man has enjoyed great successes in the commerce of Laguna, including the Casa del Camino and associated super popular Rooftop. After that came the successful restaurant The House of Big Fish and Ice Cold Beer which, unlike its name, enjoyed the spotlight with some brevity. Yes, Big Fish is closing and will be missed, but Keller had some tough business decisions to make. Big Fish is saying adios, while Keller’s partnership group, Casa Resorts, focuses on, well, resorts. Many of Laguna’s old-time locations have to thank Keller for a bit of an up-do. Big Fish came in where the Aegean Café sailed off. The Rooftop was the first of its kind to dominate Laguna sunsets since it poured its first mojito. And the Marine Room is underway with some fancy upticks, like the music stage area moved to the back room, and even some fine new bathrooms. Keller moves where the opportunities are, and where his passions take him. Lately, since he and Amy have been getting healthy with exercise and juicing, they have moved on to the next project; a juice bar. In addition to working for success in his own businesses, Keller has been very active with the Laguna Beach Chamber of Commerce, and with Visit Laguna Beach to promote Laguna as a thriving community, a destination, and a brand. He is an important spoke in the wheels of commerce, promoting business and the things that attract people to Laguna. He also has a dream of one day having a hotel in Italy. Keller comes by his drive for work and entrepreneurship the old-fashioned way – he started as a paperboy. Then when he was 15 his dad brought him home an application for the next step up the pre-corporate ladder: a pizza job. The world of a pizza parlor was Keller’s intro to the hospitality industry. He worked there day and night, and found out he loved it. That led to a career path via Johnson and Wales University where he earned a degree in hospitality. From there he was invited to help open the MGM Grand in Las Vegas. “Las Vegas was an amazing place to live, and I thought I wanted to be president of MGM Grand!” he said. But one day his friend called him from California. His friend had a Hilton Hotels colleague who wanted Keller to give him a tour of Las Vegas. It must have been some tour because that guy made Keller an offer that got him to leave Las Vegas and find his future in Southern California. “I had no idea I would love it so much,” he recalls. After working with Hilton in Anaheim, Keller joined with his friend and another partner to buy the Casa del Camino Hotel in Laguna. “Every time I came to visit Laguna I thought, I wish I lived there!” And so he did. “There’s room enough for two – up on the roof…” so the song goes. Even Keller admits it’s been matchmaker heaven up on the roof of Casa del Camino, at The Rooftop. But for him, it’s personal. One day while he was up on the roof, a cute girl came in. She was giggling and talking with a friend, and caught Keller’s eye. He came over to the table and met Amy Amaradio. That was it. They’ve both been over the moon since. While Amy handles marketing and PR for Casa Resorts, and is busy with the juice bar, she’s also been hands-on with their daughter, Alexis, who is an LBHS sophomore, and mom to Rocco, born nine months ago with Down Syndrome. Like only parents raising special needs children know, it’s definitely not easy but the rewards can also be life altering and blissful. “It’s my best experience in 43 years of life,” Keller said. “It’s a whole other enlightening experience that I’d never thought about. Keller is an integral part of the fabric of this community and a family man surrounded by love. To say that Ruben Flores, owner of Visionscape, Inc. and the reinvigorated Laguna Nursery, has a green thumb is stating the obvious. With a BS and an MBA from Cal Poly Pomona in Ornamental Horticulture and Landscaping Design and Business, respectively, and a last name that literally translates to “flowers” it would be surprising if he didn’t. What is a surprise is the extensive reach of his “green thumb,” going well beyond just plants and flowers to basically anything he sets his sights on. If something needs new life, Ruben Flores is the man who can reinvigorate it. Take his Laguna Nursery, for example. Flores purchased it seven years ago on a “whim”. Having been a nursery for the past 52 years, Flores felt compelled to save it from its fate of becoming a storage space for a local hotel. “The nursery had been through several owners and gone down, down, down as far as it was serving the community,” he explains. Flores decided to fix that, in addition to running Visionscape, Inc., his landscaping design firm now in it’s 26th year. “That,” however, was no easy task. Lots of factors are working against the nursery business these days, according to Flores. “There are lots of reasons not to garden,” he says, listing things ranging from people’s aversion to too much sun exposure to the increased interest in drought resistant plants. “It used to be everyone bought tomatoes and rose bushes. Now it’s drought resistant plants and succulents.” Flores is a fan of drought resistant plants and succulents, but since one of their selling points is their heartiness and longevity, they’re not replaced as often as rose bushes and tomatoes. This means less need for people to venture to the nursery. So Flores had to create reasons for people to come. “I brought socialization into the nursery,” says Flores. “Everybody realizes the value of social media. I’ve taken that on at the Nursery. We expanded horizontally. So we have plants, statues, fountains, but we also have a baby grand piano and do cabaret nights and concerts. Walking through the nursery there is a lot to see besides plants. Art, from sculptures to paintings, from 32 countries are represented at the Nursery. With jobs that take him all over the world, as well as the US, Flores has ample opportunity to collect beautiful and interesting objects. “I want there to be the interest for the exterior that we have in the interior,” he explains. His interest in the “exterior” got off to a dynamic start. Fresh out of school and lecturing on coastal plants he was hired to do the landscaping of Laguna’s “Villa Eden”. As he worked on that job, he got another one down the street. He tells me his first two jobs were for $25 million dollar properties, laughing, “I have an interest in coastal plants. The most expensive homes tend to be on these coastal sights. That was not my intention.” But it turned out to be a very happy accident. “The second house was owned by Severin Wunderman. “He changed my life,” says Flores. “He had seven houses and I did all of them.” Wunderman, who died in 2008, was a well-known art collector and philanthropist who made his fortune in the watch industry. In his landscaping business Flores says he did “the isolation thing. I’m my own man doing my own thing.” The purchase of the nursery, however, changed that. “I realized the store can’t exist without support from the community. I started to reach out, make alliances.” Now firmly entrenched in Laguna Beach civic life Flores’ reach extends to a surprising number of organizations. He’s involved with Laguna’s HIP District; he’s on the board of the South Laguna Community Garden and the Pacific Marine Mammal Center, is president of the Laguna Beach Beautification Committee and the Laguna Beach Sister Cities Association. With such an array of groups, his involvement may have originally been motivated by business considerations, but it has obviously evolved beyond that. Listening to him speak about the people and projects he’s involved with it’s quite obvious his interest is personal. The Sister Cities Association is another organization that has caught Flores’ attention and is flourishing as a result. “We are creating three 15’ x 15’ plots at Heisler Park, with room to add two more, for gardens that represent our sister cities: Menton, France; St. Ives, England and San Jose del Cabo, Mexico,” he says. When Flores gets involved, expect things to grow and get done - two good traits for someone whose life revolves around plants. Flores has gotten to the point in his career where he can be selective regarding the jobs he wants to work on. “I will do your place if it’s photographable, even if it’s just 200 square feet, but it has to have something. We’ve done most of the notable houses in town so when you’re working on that caliber you want to do things that challenge you,” he explains. Talking to Ruben makes you want to be outside. The Laguna Nursery was created to entice you to do just that. More than just a place to buy plants, Laguna Nursery represents possibilities - of what you can do to transform your home and what a business owner can do when they are committed to reinvigorating something in need. Revitalization is something Ruben Flores knows a lot about. Whether it’s plants, an exterior space or a community group, he can’t seem to help but give things new life. Scott’s personality makes an impact without his even trying. Not surprisingly, people notice and often comment about his appearance, or his accouterments – basically his way of expressing himself. He’s come a long way from his childhood sense of self that was distinctly at odds with the ideology of small town Oklahoma 45 years ago, including a mean and alcoholic father. He knew he was gay, and it didn’t fit the paradigm. Thankfully he’s survived and flourished, and managed to secure housing in one of the 25 apartments in Laguna’s Hagan Place. Scott is happy and upbeat, but he stresses the importance to not give up or forget the battle against AIDS. “You don’t see many red ribbons anymore,” he laments. Scott knew he would love to live in Laguna the first time he drove down Coast Highway by Main Beach. He had been living for a while in Huntington Beach, and one day the police came to his door and arrested him. They hauled him off to the station while they went through a series of charges. When they realized they had a case of mistaken identity, and that Scott was not the guy they were looking for, they simply told him, “Go home.” With no car, no money, and barely any clothes on his back he walked all the way back to his home with a bad taste in his mouth for the type of treatment he was shown. By contrast, Scott discovered friendlier police while driving through Laguna. And Amber’s just fine with that too. They have a lot in common. Even before Scott moved here for good in 1999 he had some Laguna history. He lived in the canyon for several years in the 70’s and 80’s, and even got married. They were friends, she had a “cool little kid”, and Scott didn’t want to see them go on welfare. He helped her to get a job, and the son to stay in school. “I’m a catch, I guess,” he laughs. The other thing that marks Scott around town, and anywhere else, is his mode of transportation. It all started in a small garage in LA in 1986. Scott was the proud owner of a 34 year-old VW. It was a little beat up, with three different colors of primer, but ran like a champ. So he decided to let some friends on a graffiti crew go wild sprucing it up. “I told them, ‘I don’t want to know what you’re doing, just wow me.’” Work progressed in his driveway, and despite police cruisers passing back and forth making sure, it was all very legit - and artistic. “They painted it up space themed, and I’ve been on that ever since,” says Scott. The Virgin of Guadalupe as an extra-terrestrial caught the attention of another friend who said, “You gotta meet my friend…” And so it went until there were five or six cars worthy of attention. He’s been to art car festivals in Seattle several times, as well as San Francisco and Texas, but it’s expensive just to get there (especially Texas!). “They’ll usually house you, and feed you, and pay twice what your gas costs to get there.” Really, it’s for fun and community. Scott will often put on his kilt (“Once you wear a kilt, it’s hard to wear pants!”), get in his latest car, and go in search of art. Not too long ago, he was on his way to Slab City, that place in the desert where squatters and RV’s camp “off the grid” amongst the concrete slabs left from abandoned World War II Marine barracks. It’s another form of community. Nearby, there’s a sculpture garden called “East Jesus”. Scott met a man there who cleaned up trash and arranged it, creating “art builds”, and a sculpture garden. It is something of beauty from some things of decay. They talked about life, art, and feeling different from other people, like an outsider. The man listened as Scott told him about Burning Man (the living community of art, temporarily constructed and attended by more than 50,000 people for one week every summer in the Nevada desert), and how he wanted to go, but tickets were so expensive. When Scott got home, he received a package from the man. Inside were Burning Man tickets and five ounces of silver. Scott’s not sure about the silver, but the man told him that he related to him because he too felt outcast and uncomfortable when he was young. Until surgery, he was self-conscious and ashamed because he had a condition of gynecomastia. Scott had never been to Burning Man before this year, and it was a transformative experience. The connection with the other people there opened Scott’s heart. The man in East Jesus has promised Scott tickets to Burning Man for the rest of his life. There is a passage in Faye Chapman’s book of photos, Faces of the Shadows: Life on the Street that says, “Be kinder than necessary, for everyone you meet is fighting a battle.” To hear Chapman talk about the homeless, a cause that she is deeply committed to, is to understand how much she takes those words to heart -- and how much she wishes others would, as well. Faye Chapman was homeless for a brief time, many years ago before she came to Laguna. She didn’t think of herself as homeless, but technically she and her daughter were without a home of their own one summer and, therefore, “homeless.” Chapman sent her daughter to stay with her grandparents in Indiana while she slept on friends’ couches, worked two part time jobs, took photos for the local paper, sat on the Board of the American Heart Association and volunteered with the PTA. The volunteer work was required so she could get food from the local church. “That was a great program. You felt like you earned your food instead of it just being a handout.” Eventually, she saved the money she needed, her daughter returned for school and life resumed. Her “homelessness” was over. Talking to Chapman about this time in her life, one marvels at the stamina she needed to do what she did. She says that when she thinks about it she’s a little surprised at what she was able to do, as well. “How did I do all that?! Now I can’t seem to get anything done!” she says laughing. Hardly. While she may not be working three jobs anymore, Faye Chapman gets quite a lot done, especially for the projects she believes in. It would be easy to assume her interest in homelessness was brought on by that summer so long ago. While that experience may have opened her up to the frailty of stability, it was not as significant as another event that happened years later. She says that what started her down this path of working with the homeless was a chance encounter with a homeless woman who accidentally walked into a picture she was taking while at Venice Beach. By then, Chapman and her daughter had moved to Laguna Beach and Chapman was working for the local paper, at the time run by Stu Saffer. “I asked Stu if I could take pictures of the homeless. He said, ‘OK.’ Every city I went to I wanted to find out about the people there. You can’t generalize. Everyone has their own journey and story: medical bills, a divorce, mental illness, no family. I found that most of the time these were good people who had bad things happen to them.” She published her book of photos in 2007. Getting to know their stories prompted Chapman to want to do something to help. So Chapman joined what was then the Laguna Beach Resource Center (now the Laguna Beach Food Pantry). When Chapman joined the Resource Center they had three areas of focus: the homeless, the food pantry and disaster preparedness. A few years ago, the group decided to focus solely on the food pantry so Chapman left to continue her focus on homelessness. “I was on the [city’s] Housing and Human Services Committee, still am, actually. Six years ago I came up with the Hunger Bowl. I get bowls donated from all over the world and they’re used as silent auction items. I get restaurants to donate food; local kids make bowls that we give to every guest. It gives us the chance to go out and talk to the kids about homelessness, tell them to look them in the eye, be kind, don’t be afraid of them. So it’s great that way, and it has turned into a very fun event,” explains Chapman. Last year the event raised $20,000 and she hopes to double that this year. She’s still accepting bowls if anyone, artists in particular, would like to donate. Tickets are $45 for five tastes of soup, one dessert and a keepsake bowl made by students at LBHS, Woodbridge High School or Trabuco High School. “There is a Board that decides how to spend the money we raise. 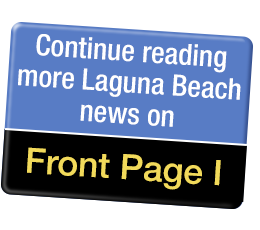 Last year the money went to help paying for prescriptions, a huge need.” She detailed how a new program, organized with the help of Dr. Tom Bent of the Laguna Beach Community Clinic, provides $10 prescriptions at Laguna Drug. “This is huge! I’m very excited about this program,” says Chapman. The old process for getting prescriptions filled for homeless people, she explains, required them to navigate via public bus to Wal-Mart. For a population already facing so many challenges, this extra complication meant that many did not get the medicine they needed. Getting them access to medication close by is a small, but extremely meaningful improvement, for many of Laguna’s homeless. A year prior to the Hunger Bowl Chapman says, “I asked the city to proclaim National Hunger and Homeless Awareness Week. This year it’s for a month.” There are several citywide projects to get involved in. One is a food drive. Last year’s food drive added 50,000 lbs. of food to the Food Pantry. “It brings in the whole community,” says Chapman. There is also “Meal-less Monday” where we are all encouraged to go without lunch, buying someone in need lunch instead. The same can be said of Faye Chapman. She has a lot on her plate (or in her bowl), but it all seems to come back to the same starting point: compassion. Instead of letting herself get overwhelmed by the hugeness of an issue like homeless she focuses on what she can do to make people’s lives better -- here. I asked her when we were done talking if she had anything she wanted to make sure got included in this piece. What she said was not what I was expected, but I should have. She thought for a moment and said, “Treat homeless people as people. Be kind.” These are words that Faye Chapman certainly lives by. Aaron and Shira had a plan about the money gifted to them at their B’nai Mitzvah. They are brother and sister, and since they are so close in age they celebrated their coming-of-age in the Jewish faith jointly. Together, they were greater than the sum of the parts, as they both wanted to use the money, as well as their every available minute making a difference in the lives of Laguna’s most desperate and impoverished population. Aaron, now 17, is a senior at Laguna Beach High School, and Shira, 16, is a junior. What they started four years ago has now blossomed into a philanthropic club at the high school called “Friends in Need”. They started with helping the homeless. Ambitiously, they got Panera Bread’s acceptance, and began regularly picking up day-old and other gifts from the Panera restaurant in Aliso Viejo. They thought it would be great to bring it to Main Beach for the homeless people there. There was already the Alternative Sleeping Location in place in the canyon, and the idea was to keep meal donations centered there. On one of his return trips from the ASL, Aaron was moved by the sight of countless day laborers anxiously waiting in the sun for a car to drive up and offer them a day of work and wages. The Day Laborer site is perhaps a scary unknown to many residents of Laguna Beach. For many others it is also a source of competent, ready, and willing workers for a day of difficult tasks at fair or below normal wages. How could he pass by without a care? Answer: he couldn’t. Aaron and Shira started to visit the day laborers. At first the men there were wary, but slowly they built a relationship of trust with the teenagers. “We treat them with dignity,” explained Aaron. “They’ve opened up to us, they’ve lived some incredible lives. Beyond food, Aaron and Shira have stepped in to fill needs where they might not even be evident. “One day a guy was there and we’d brought bagels,” said Shira. “But he couldn’t eat because his teeth hurt.” They brought a dentist to the site, and a hygienist to help educate the workers with proper dental care. “One day there was a guy with an eye infection,” Aaron chimed in. “His eye was swollen completely shut.” They brought him to Sleepy Hollow Urgent Care and paid for his care with their own money. The gratitude bestowed on these kids is heart-warming. We joined Aaron and Shira at the site, workmen clamoring to get to the car as we pulled in. Once they knew we were there to talk about what Aaron and Shira are doing they were all smiles and handshakes. “They are so great,” one said of the teens. Another showed us the best thing that they did to improve the dry and dusty site, where sometimes a hundred men will be sweating in the heat: a water fountain. Instead of bringing in cases of wasteful plastic bottles, Aaron and Shira decided on a better plan; they’d get them a water fountain. Using their B’nai Mitzvah money, and what friends would help with donations, they raised the $3,000 for a permanent water fountain. Meanwhile the teens fund-raised for more projects. They called on friends and family, and started the club at the high school to broaden their reach. The Friends in Need club doubles as Santa during the holiday season. They do a winter coat drive, and their Christmas project is to get all the day laborer names, their spouses and kids, and where they live. Then they raise money, go to Target to purchase gifts, and host wrapping parties at the high school. On Christmas Eve they’ve gone out and delivered presents to every single family. It was quite shocking at first, to see the conditions in which many of the day laborers live. They have also just installed a retractable awning at the Day Laborer site, to provide shade, or relief from rain. “The guys who get the jobs are the least wet,” said Shira. Also the guy who can speak English. The biggest effort for the club these days is to provide the tools for learning English. Two years ago, the students got 40 vocabulary textbooks donated. They are kept in the little trailer on-site, but the workers can use them during the day, or purchase them at a nominal cost to share at home. The teens help teach and practice English with the workers. There are now 65 students from the high school who have joined Friends in Need. Their long-term goals include a permanent bathroom at the site, a gutter for the trailer building so rain doesn’t come in, and one day to have a classroom building. And then there are the other things that lie in the hearts of these two caring and compassionate teens. They are both deeply committed to the arts. Shira began dancing when she was a little girl, with Miss Linda’s Castle, and Kyne Dance Academy. She’s now in the LBHS varsity dance program daily, with a seventh period enrollment in a second dance class. Aaron is musically gifted all around, playing piccolo, piano, guitar, and ukulele. But that’s all trumped by the trumpet. He’s earned All State, and All Southern auditions, and he plays the trumpet with the Pacific Symphony Youth Orchestra. His college plans include music, but he’d like to go for a pre-med major. He’d like to be an ER doc, like his dad. We doubt there’s any stopping these two heartfelt, high-achievers. Everyone should have the pleasure of meeting Ricky Figueroa. Why? Because it never hurts to meet someone who genuinely cares about others. It also never hurts to meet someone who can teach you something you didn’t think you needed to learn. So, while it may be a difficult prospect to schedule lunch with a man who works from 4 p.m. to 2 a.m. (longer on weekends) six days a week, if the opportunity should present itself – jump on it. For the last five years, Ricky Figueroa has worked the night shift at the Stop-N-Go in north Laguna. Prior to that he worked at the Mobil station downtown for four years, also the night shift. So he’s certainly adapted to those long, late night and early morning hours. “I like the night. Everybody is happy to be off school or off work, plus after 10 it gets very quiet. I feel safe,” he explains. The fact that he prefers working at night is not what made such an impression on me (although, it does seem incredibly challenging for a non-night owl like myself). What affected me so profoundly was the true enjoyment he derives from his job. As he explains it, “When I’m working it’s when I feel like I’m home. It’s more of a social life. Friends come in and visit. People come by after work. I can help people if they need something. I feel very blessed.” The Mobil station did not provide quite the same experience. It didn’t have the sense of community the Stop-n-Go does. And after listening to Figueroa discuss the people, particularly the kids, who frequent the store it is obvious how important community is to him. When I ask him how many times he has actually been to the beach he laughs again, “Only about six times.” It’s not surprising considering his hours, plus he works another job part-time buying and selling computer parts online. That doesn’t leave a lot of time for beach going. The store is its own tiny microcosm of paying it forward. The idea of treating others how you would like to be treated is an important one to Figueroa and one he takes very seriously. “My parents trusted me when I was a kid. When you trust a kid they feel it and give it back to you. I give my mom and dad a lot of thanks. They let me do what I want because they trusted me,” he explains. This philosophy is something Ricky puts into practice everyday at work. He sees the people who come in as more than customers. And most of his regular customers see him as more than the guy who rings up their order. It is with a fair amount of pride that Ricky tells me how customers he has seen grown up will come in to Stop-n-Go to buy their first beer on their 21st birthday, not because they really want a beer, but because they are so happy to show him their ID. But the ID better be real. Figueroa has a pretty good idea of how old his customers really are, plus he very likely knows their parents, and will give the parents a head’s up if he thinks it’s necessary. After a few of his tales of thwarted teen purchases, I felt compelled to whip out my phone, show him a photo of my two teenagers (whom he recognized) and grill him as to their purchases and general behavior. I must say I feel better knowing he’s there, keeping an eye on things. “I think he likes how I treat him with respect. It’s important to hear what kids say. Being a child is not easy, for me either, “ says Figueroa with a laugh. “I had someone behind me showing me the way. That is something all kids need.” The “he” Ricky is referring to is a boy named Monty. According to Figueroa, Monty was a frequent Stop-n-Go customer and the two built up a friendship. When he was about 14 Monty told Figueroa that he needed to choose a hero for a class project. He chose Figueroa. “The other day when I was a little down I remembered that and it picked me up. That was nice. I also had one of the kids ask me how much I make to work here. I just laughed and he told me that when ‘I get big I’m going to buy this store and give it to you.’ These are things that make you feel good. I feel blessed.” And he really does. That’s why the chance to chat with Ricky Figueroa should not be squandered. Gratitude. Trust. Respect. These words carry a lot of weight with him and when you talk to him it’s easy to feel like maybe they should carry a little more weight with you. There’s feeling these things and there’s living by these things. I thought I was the former until I met Figueroa. That’s where I learned my lesson. If I use Figueroa as my standard, I’ve got some room for improvement. So, if you’re driving by and you need a bag of ice or you’re craving some chips, stop in. I’m pretty sure you will get more than you thought you needed. Everyone says he’s a character, and sure enough, the first time I see Creighton Wall he is actually in character: Captain America. Creighton and his brother Spencer grew up in Nebraska, and they were always close. So when Spencer moved and started a life in Laguna, Creighton seized every opportunity to come out and visit, along with their parents. Back in the flatlands of Nebraska, Creighton was something of a big fish in a small pond. Just about everyone knew everyone, but especially so in the community of individuals with Down Syndrome. They would get together socially, often for movies, their bowling club, and regional events like the Special Olympics. Creighton was also known around town by his bright red VW. He would drive to his custodial job at the YMCA. That’s a relatively easy trade-off for the life of independence he’s found at Glennwood House. He’s not a fan of chicken salad. “My buddy Carter,” he continues, “we’re the ‘dynamic duo’ of Glennwood.” They share a love of movies. It’s an independent life no one in his family might have imagined for Creighton. Now even his parents have been smitten with Laguna, and recently bought a home here. “It’s everything I ever dreamed of,” adds his brother, Spencer. Creighton loved the beach and when he’d come for visits, he’d swim out to the buoy off Main Beach. He would meet people, and make sure they’d smile. He’d make knotted bracelets and sell them on the sidewalk during Art Walk. And he always loved Disneyland. “California is my wonderland,” he says. While Creighton was growing up in Nebraska, he reached that particular age and point of realization that he couldn’t eat everything he wanted. It was a tough lesson, because he has a special fondness for Cheetos and other non-healthy snacks, but his weight was climbing and he didn’t feel good about it. As part of the plan, he documented his journey in fitness and weight-loss in his own book, I Used to be Down, but Now I Love My Life. Now he adheres to a one-bag-of-Cheetos-a-week plan. “I want to get my book made into a movie!” Creighton offers up, hopefully. Enthusiastically, next he plans to write a book about recycling. Creighton looks at life in terms of what he can do, which is a lot, what he wants to do which is even more, and what is most important: spreading happiness. On the road to fitness, Creighton did a lot of swimming and working out at the YMCA, in Nebraska. He enjoyed it so much there, that he started volunteering. And he was so good at it, and so dedicated, that they hired him on for custodial work. He worked from 5:00 a.m. till noon every day. He’s proud to say that he was named “Employee of the Year”. He’s hoping for a similar path since discovering the Laguna Niguel YMCA. Jimmy is happy for Creighton’s friendship, and for his volunteerism. He takes the bus there at least twice a week, and helps out at the facility, also with their custodial duties. “It’s my stress reliever. But I won’t do toilets,” Creighton said, laughing. We look forward to following his progress in the Special Olympics, in all the sports he likes: swimming, boxing, weight lifting, and bowling. The Wall family has joined with the National Down Syndrome Congress every summer, an event that brings them all over the country to raise awareness, and foster friendships. Creighton’s family has been enjoying the event almost every year of his life. Creighton has become close with a girl from Atlanta through this event, and they continue their friendship via Facebook. “I want to get her to move here too,” he says. Spencer Wall has a tight bond with his brother and, by association, a special commitment to the Down Syndrome community. He brought Stu News together with Creighton, in honor of Down Syndrome Awareness Month, this month. We couldn’t have been happier to get to know this charming young man, and share his story at this special time. Spencer started working in Laguna, and even met his future wife through a connection to the Down Syndrome community as well. When they met, she was a nanny for a family in Laguna with a Down Syndrome child. Spencer is not only Creighton’s brother, he’s his biggest fan - and the feeling is mutual. Meanwhile, Spencer is married, and has a son he named for Creighton. It’s his middle name: Samuel. Creighton is close to his brother and sister-in-law, and is the proud uncle of their son, Sam. Along with his sister’s children, Creighton has even more bragging rights. “I am an uncle to three beautiful kids,” he says, beaming. Thanks to Spencer’s good friend, Chris Keller, himself a father to a Down Syndrome child, Creighton has also found a new purpose; he is downright passionate for recycling. He goes to Keller’s Rooftop restaurant often with other Glennwood residents every Thursday to sort their recyclables. Then on Fridays, they take them in to the recycling center in Dana Point. He’s a “regular” at The Rooftop restaurant. Regularly helping out! Creighton has made new friends with his same high level of abilities at Glennwood, and has been embraced by Laguna as he gives back to the community. Lynn Epstein has a lot of energy. When you’re on the floor, working with young kids for a good part of your day, that’s a helpful trait. For the last 28 years Epstein has worked with children as a speech pathologist, helping them find their voice and better communicate with others. Communication, to Epstein, is a theme that not only runs through her work life, but it’s an important part of her life away from work, as well. As a former stand up comic, a writer and illustrator, an award-winning performer and an App creator, this highly-regarded speech pathologist, who has committed herself to helping others communicate, has a lot to say herself. While busy with her comedy, Epstein was still working full time as a speech pathologist. She finally decided that rather than doing what she did for others, she could do it for herself and opened her own practice. This put her stand up on the back shelf. Nevertheless, she still managed to find the time to write and illustrate a book titled “Why is It? !” that has 80 pages of questions such as, “Why is it the one who snores falls asleep first?” and “Why is it your mom said, “Be careful” AFTER you fell?” Epstein gave me a copy and joked that it fits perfectly on top of toilet tanks. It’s not hard to picture her in full comic mode, gleefully embracing whatever role she is assigned. It’s pretty clear that when Epstein is “in”, she’s “all in”. When she taught her comedy classes her adult comic students came willingly. Sometimes, however, her younger students who arrive at her office for therapy need some coaxing to let her teach them. Humor is a perfect way “in.” “When a kid says, ‘You’re funny’ I’m all, ‘Yes!’ This is all a little bit of science and a little bit of magic,” as Epstein describes it. Just to make sure she stays going at full throttle, Epstein is presenting at the American Speech Language Hearing Association in Orlando this month, an honor she is very proud of. Her paper has to do with the parental component of therapy, an area that is critical to her students’ success, but often overlooked. “The first year they didn’t accept my paper, but they encouraged me to try again. I guess you can’t quote yourself,” she explains with a laugh. But she went back, found more research on things like the “grieving process” of therapy, as Epstein describes it. Because therapy can be such a commitment, it can impact a family’s life in ways that, while not tragic, can be stressful. “Sometimes it’s not what the parents expect. Their kid can’t go to ballet anymore, they miss their other kids’ soccer games, it can be expensive,” she explains. All these things can put stress on families. By developing a better strategy for bringing parents into the process, Epstein believes she can help minimize that stress while better helping her students. “I always say I’m a jack of all trades, master of one – that’s framed on the wall,” laughs Epstein. And if she can do it while making you laugh, all that much the better. “Are you Boris?” I asked the first gentleman I see at the coffee house. No, not him… “Of course!” I mutter as I smack my forehead, for there is the real Boris entering the coffee house, all six-feet-seven of him. I remembered he had been a pro basketball player. Piskun had contacted Stu News because he was motivated by another Laguna Life & People story we had written about high school students, Aaron and Shira Alcouloumre. He wanted to help them in their work with the Day Laborers in Laguna. While he has a giving heart and a kind soul, Piskun also shares a personal reality about the hardships of immigrants. Piskun grew up playing basketball in the different leagues of New York City, where he was nicknamed, “The Mad Russian”. His dad drove a cab for 10 hours a day, then followed that with factory work for another six. “It’s the immigrant mentality,” Piskun said. They counted their blessings. Life was better in America. Things were worse in the Soviet Union, or as he grew to learn, in South Africa under apartheid, and later in Tijuana where these days he witnesses people living in the dry river channel on a concrete embankment filled with tents. Part of this philosophy stems from Piskun’s business. He and business partner, Andrew Gold, have a telemarketing company that targets solar energy for residential markets. He commutes to his office every week in the opposite direction of thousands of other people - into Mexico. Piskun’s business employs 200 people, many of whom are Mexicans that were deported from the US. Having been deported mostly for non-violent crimes, such as DUI or drug possession, deportees’ lives can go from comfort to destitution before they realize what’s happened. One minute they may be having respectable, comfortable lives in the States, and the next they find themselves broke and homeless on the other side of the border. Piskun has seen it all from the comfortable perch of life on the US side of the border, and also as a Tijuana employer. Piskun’s global outlook was born in Azerbaijan, and nurtured in New York (including a degree from Columbia University). Then he spent a couple of years as a pro basketball player in Israel. Just when he thought he’d go into banking (“I’m a finance/numbers guy!”), he visited Laguna, met a gal, and everything changed. Life is what happens when we’re busy making other plans, right? Today he has a three-day-a-week commute to Tijuana, tennis has transplanted basketball, and he has two very important people keeping a smile on his face: Bella and Ruby. Bella, nine years old, and Ruby, seven, are that special age that parents adore. “These are the times when kids think you’re cool,” says the cool dad. And they are the reason Piskun plans to help with the Day Laborers in Laguna. He’s a giving person who believes in volunteerism, and teaching that same practice to his daughters is what it’s all about. One of the immediate needs that he’s focusing on right now is his dear friend, Alyssa, who is battling stage four cancer. On a scale of just-not-fair-ness, she came up short. “It’s a roll of the dice, and she got snake eyes,” he says. Along with other friends, he is busy organizing efforts to help with her medical treatment and with the care of her son. Spoken like a true forward.